During the annual migration of thousands of northbound hikers traveling the 2,650-mile Pacific Crest Trail from the Mexico border to Canada, the author walked a segment of the trail in Washington. Here’s who he met along the way. They’re easy to spot this time of year in the North Cascades: lean, fast-moving hiking machines in their trail-running shoes, ultralightweight backpacks and a look in the eyes that says they have places to go. It’s the annual migration of thousands of northbound hikers traveling the 2,650-mile Pacific Crest Trail from the Mexico border to Canada. Most of them began the journey in late spring, which means to reach their destination before the snow falls, they’ll need to average at least 18 to 22 miles per day. Hence the look you get as they whoosh! past you on this well-traveled highway to heaven, their eyes clearly on the prize ahead. And that is the reason my two backpacking companions and I chose to hike a portion of the Pacific Crest Trail just south of Stevens Pass, in early August — before the wildfires in British Columbia and Washington turned the Cascade Range into the Smoky Mountains. 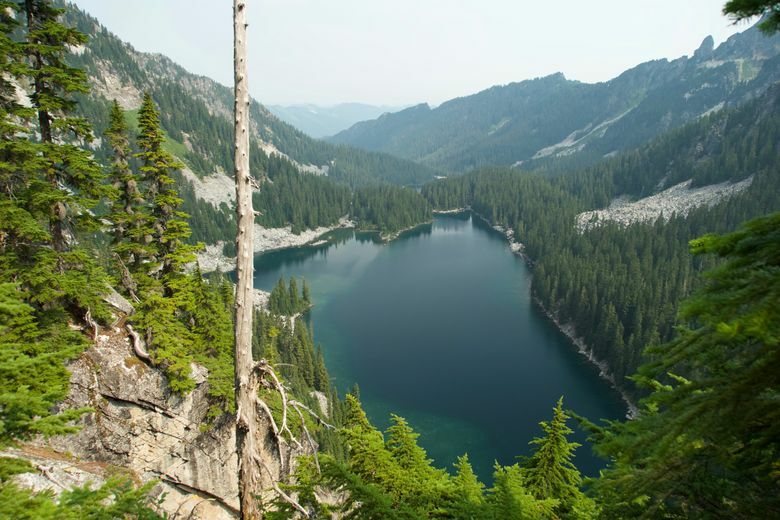 At this point, long-distance PCT travelers, or “thru-hikers” as they’re more often called, are just beginning to experience classic North Cascades hiking, with its signature glacier peaks and glistening, high-Alpine lakes. Our original plan was to begin on the PCT at the ski resort at Stevens Pass and hike to Trap Lake — and possibly Surprise Lake — and back. But by beginning at the Surprise Creek trailhead near Scenic, just southwest of Stevens Pass, we would shave off about 9 miles each way, reaching Surprise Lake rather easily and still spending a good amount of time on the PCT. Our ascent to nearby Glacier Lake and beyond the second day would put us on the well-traveled PCT, where we hoped to cruise at a higher altitude and meet some thru-hikers. We weren’t disappointed, though few had time for chitchat. The first couple, earbuds in place and eyes fixed straight ahead, blew past us with nary a hello. We would meet six other thru-hikers in the morning hours, including a brother-and-sister team, John Michael and Sarah, who went by the trail name “Himalaya.” Coincidentally, one of my hiking partners had met the pair a few weeks earlier on the PCT near Mount Jefferson in Oregon. Why the spike in popularity? According to Mark Larabee, associate director of communications and marketing for the Pacific Crest Trail Association, the 2014 movie “Wild” (Reese Witherspoon’s portrayal of author Cheryl Strayed’s solo hike on the PCT to recover from a personal tragedy) kick-started the increased interest. A growing sense among young people to “get outdoors” and an explosion of industry supplies for backpacking have also been factors, he said. We traveled the PCT as far south as Pieper Pass, getting better and better views of Surprise and Glacier lakes behind us every step of the way up to the 5,900-foot summit. The return to Surprise Lake that night and the trailhead the following day meant we had traveled 16 miles and climbed 3,700 feet. We accomplished our goal of backpacking this classic section of the PCT, even if it was just a small segment.